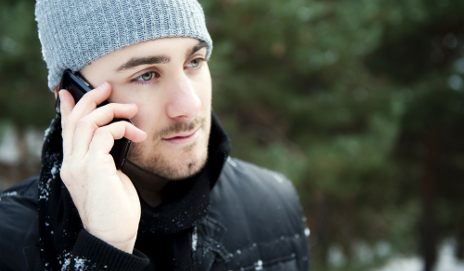 iPhone suffers at -5˚C – can your phone take the chill? Most of us are suffering from sub-zero temperatures, but we’re not going to stop going about our business just because of a bit of snow and ice. But what about your phone – will it keep running as temperatures drop? If it’s an iPhone 4S, maybe not. It was news to me that Apple says its iPhones can only be used in temperatures between 0 and 35˚C. However, a report by MikroPC (Finland’s PCWorld) points out that Apple revokes responsibility if an iPhone stops working in temperatures below 0˚C. I don’t own an iPhone, but I know plenty of people who do, and yet I’ve never heard of anyone’s iPhone breaking down as snow falls around them. So perhaps Apple is just playing it safe? MikroPC took an iPhone 4S, and 15 other mobile phones, to Finland’s Technical Research Centre to find out. Well, Apple isn’t lying – as soon as temperatures dropped down to -5˚C in MikoPC’s test the iPhone 4S started to report errors. When the temperature dropped another five degrees it packed it in altogether after announcing a dead battery. Nokia’s N9 also performed badly at similar temperatures. In fact, most smartphones kicked the bucket at temperatures colder than -15˚C. It was the slightly more humble feature phones, like a cheap Nokia C1-01 and an old Nokia E65, that stayed the path until temperatures of around -40˚C. Now, that’s bloomin’ freezing and it’s good that the Finnish mobile manufacturer could ensure they’d survive at such temperatures, as -40˚C isn’t rare in the middle of Finnish winters. And although we don’t have to worry about such Arctic temperatures here in old Blighty, we are certainly suffering from chills that would stop an iPhone or Nokia N9 from working. The thermometer plummeted to as low as -10˚C in the New Forest (at night) when I went home for the weekend. So is there a smartphone that can grit it out? Apparently Samsung is the company to lay bets on. This Korean phone manufacturer guarantees its phones will work as low as -20˚C, and the popular Samsung Galaxy SII actually held out until -35˚C in MikroPC’s tests. Who knows how Samsung has managed to do it – it’s partly due to its AMOLED screen which can take the chill, unlike the LCD screens you’ll see on Apple’s iPhone. But the fact that its battery kept on working, where most phones would report that it was dead (due to a chemical reaction in cold temperatures) is impressive. So, would the performance of these phones at such low temperatures affect what mobile you’d spend your money on? I know most of us wouldn’t want to take our gloves off to use a smartphone in such chilly conditions, but what if you were stranded with snow up to your knees in the middle of the night? Wouldn’t you want to put your hopes in a more solid feature phone or a Samsung smartphone, than in something that will pack it in as soon the weather threatens to go below zero? We already need to worry about charging a smartphone every day, making sure that they are not exposed to a drop of rain and be careful not to drop them or have them stolen. Incubating them at a comfortable temperature seems fairly easy, since we have a body at around 37C if we are alive. Inside pocket, shirt pocket…? Hopefully the poor thing will not be exposed for long enough to insult its battery or display. I have a good idea. Why not turn these clever toys into tools that are capable of surviving how human beings might use them? What we have at the moment is dumb phones not smartphones. As far as I know, all batteries are adversely affected by low temperatures. That’s one of the reasons why cars often fail to start in cold conditions. With cars used in cold conditions, it is best to install the largest battery that will fit in the space available. If we have larger batteries in smartphones then they are more likely to carry on working in the cold, despite the drop in performance of the battery. Let’s have decent sized batteries in phones. They won’t be as slim, they will cost a little more, but there are many advantages of bigger batteries. Thanks for the comments so far. Thought I’d come in and put a spanner in the works. MikroPC’s tests are a little off the mark in that they were tested in perfect conditions – that is, no-one was holding the phones. In real life you’d have your phone in your pocket and hold it when you use it – this would bring the phones temperature up, meaning that if though the thermometer will read -5, the phone might not be at that temperature in your hands. Worth thinking about. If the phone is kept warm when not in use, using it will generate heat within the battery and help keep it warm enough for use. The display could be a greater problem, but who is going to stand there making long calls in freezing conditions? Hi Wavechange, the temperatures measured in the test were external temperatures, so the battery was likely at a higher temperature. So the iPhone suffered when it is -5 externally, no matter what temp the battery was at. I don’t think I have -5C in my pockets, I also agree with Wavechange, your body temperature, wherever you keep/hold the phone will not let the phone to freeze, so that test was quite pointless. The tests were not pointless. You guys are missing the point. MikroPC performed tests to see at what ambient temperature a phone would have problems working or shut down. That is useful information. For the iPhone, it means if you leave your phone out in the cold when it is -5 deg long enough, so that the ambient temperature conditions permeate the phone, the phone will stop working. Of course, if you have the phone on you, in your coat, pocket, hand, etc, the phone is not exposed to ambient temperatures and will be at higher temperatures. It will likely not shut down unless you die and the phone’s surroundings eventually drop below -5 deg C.
I work in Greenland where outside temperatures regularly hit -20 deg and have used both an old iPhone 3 and the new 4s with no problems. As pointed out it is usually in your pocket (or you’re under cover) so this is a bit of a non-issue (it’s not like you go out without a coat on). More interstingly Apple’s statement about operating termperatures for the iPhone doesn’t stop it marketing the phone in Greenland! I have just returned from a skiing holiday in Switzerland where the average daytime temperatures were -8 and I have to say my Nokia Windows phone barely worked even though it was always in an inside pocket. The screen went blank at -3 and the battery life was depleted. If I needed to make a call it eventually came to life after I held in my hand for a couple of minutes. For this and many other reasons (it is unwieldy in the hand, lack of apps, battery life) I will be switching back to my Galaxy. that’s odd, since e.g. Nokia Lumia 800 just made a world record by surviving -60C. luckily lumia 920 has better battery than any other smartphone, designed to fit in hand, and has all the needed apps. Don’t forget to take your gloves off, no matter how cold it is. I was recently on a little day trip and planned to do a bunch of Instagram photos while walking around a quaint college town. The temperature was above freezing in the 30s Farenheit and after 2 or 3 photos my iPhone 4S went from 42% to shut down. I was shocked. Some much for mobile photography. Someone should market a smart phone warmer. Guys thanks for your reports. I’m in Daegu, South Korea. Using an iPhone 5. Average temperature in winter now is minus 6 degrees. And every time I take the phone out to use. Whether to receive a message or take picture it auto shuts itself down in under 90 seconds. I’m talking about the iPhone 5 held in a gloved hand while reading through messages. Ambient temperature is -3 degrees, a small headwind into me as I walked. The iPhone 5 feels like cold metal. And like i said. By my experience. Stick into my trouser pocket to warm the poor thing. Or, it will behave like it is out of battery and go down. Unresponsive till it revives and warms up. While all around me happier Koreans continue to tap into their lighted Samsungs. Misery. iPhone 5. -7c with windchill of -13c. 1min 30sec’s in use and it died. Here in Canada when we are playing in the snow, it would be nice to be able to make a call if trouble drops in. I think it is all the matter of the particular battery you happened to get with your iPhone. My old iPhone4 had never had any problem with low temperatures. Then I recently changed it to iPhone 4S 64GB which I got as used but in perfect condition except battery. I’ve changed the battery to one made in China and then the problem began. The phone only stands when it is in pocket and until I took it out and start operating. I used it for my ski walks/runs tracking, and it worked well while in the pocket but when I took out and held in one hand in a glove while operating it with another hand with glove off, it turned dark and shut down in a matter of seconds, sometime not letting me enough time to save my activity data. Same happened when I attempted to take photos. I think the glass the iPhone cover is made of lets the temperature much quicker to get inside the chassis compared to any plastic covering, then the balance between the battery heating up itself when being used against the cooling effect is not reached. The only way left to improve it is you just need a good battery. Li-Ion batteries used in mobile devises are good low temperature standers by design, but those made in China are probably with the technology process broken, and materials and environment are not clean enough to ensure quality. All that matters for them is making it as cheap as possible. I’m looking for a battery originated from a better reliable source. Any ideas where is could be searched for? Just wanted to chime in. My iPhone 4S (with original battery) has died several times while skiing in the Northwest United States. I use it to track my skiing progress. And take it out occasionally, probably about once every 2 to 3hours. I also use it to take an occasional quick picture. It’s never out of my pocket more than about a minute. Oddly, I don’t have any problems with it, when I’m only using it for pictures and not tracking my progress. It doesn’t seem to like running complicated programs while in cold weather. While skiing on Mount bachelor a few weeks ago, I kept my watch in my pocket with my phone. My watch has a temperature sensing function on it so, I checked the temperature every time I took out the phone. The lowest temperature I saw was 46° F (about 6° C). Personally I’d like to have my phone there and available and working if I have problems. Even if all I can do is send Morse code SOS flashes in the middle of the night with the flashlight function. 46° F (6° C) is really not that cold. For an original off-the-shelf prices of over $700 I think it should do better. Prior to the 4S, I had a Motorla Droid X and used it for skiing all the time. I never had a problem. I’ll probably switch back to the droid platform when my contract renews. I’ll definitely be checking the operational stats before buying a new one. I also live in Canada, Québec specifically. Our winters are consistently colder than -20ºC and very humid, my iPhone 4S doesn’t even stay on if it’s inside of a parka hugging my body. My sister has a Samsung Galaxy S4 and it doesn’t do any better at all either. She moved to Vancouver where the weather is more like London but slightly colder, the phone still doesn’t work at all in the cold. I think if you live in anywhere colder than the U.S.A. then you’re out of luck it seems.